“Russian researchers from the Moscow Institute of Physics and Technology (MIPT), the Technological Institute for Superhard and Novel Carbon Materials (TISNCM), and the National University of Science and Technology MISIS have optimized the design of a nuclear battery generating power from the beta decay of nickel-63, a radioactive isotope. Their new battery prototype packs about 3,300 milliwatt-hours of energy per gram, which is more than in any other nuclear battery based on nickel-63, and 10 times more than the specific energy of commercial chemical cells. The paper was published in the journal Diamond and Related Materials. Ordinary batteries powering clocks, flashlights, toys, and other compact autonomous electrical devices use the energy of so-called redox chemical reactions. In them, electrons are transferred from one electrode to another via an electrolyte. This gives rise to a potential difference between the electrodes. If the two battery terminals are then connected by a conductor, electrons start flowing to remove the potential difference, generating an electric current. Chemical batteries, also known as galvanic cells, are characterized by a high power density — that is, the ratio between the power of the generated current and the volume of the battery. However, chemical cells discharge in a relatively short time, limiting their applications in autonomous devices. Some of these batteries, called accumulators, are rechargeable, but even they need to be replaced for charging. This may be dangerous, as in the case of a cardiac pacemaker, or even impossible, if the battery is powering a spacecraft. Fortunately, chemical reactions are just one of the possible sources of electric power. Back in 1913, Henry Moseley invented the first power generator based on radioactive decay. His nuclear battery consisted of a glass sphere silvered on the inside with a radium emitter mounted at the center on an isolated electrode. Electrons resulting from the beta decay of radium caused a potential difference between the silver film and the central electrode. However, the idle voltage of the device was way too high — tens of kilovolts — and the current was too low for practical applications. In 1953, Paul Rappaport proposed the use of semiconducting materials to convert the energy of beta decay into electricity. Beta particles — electrons and positrons — emitted by a radioactive source ionize atoms of a semiconductor, creating uncompensated charge carriers. In the presence of a static field of a p-n structure, the charges flow in one direction, resulting in an electric current. Batteries powered by beta decay came to be known as betavoltaics. The chief advantage of betavoltaic cells over galvanic cells is their longevity: Radioactive isotopes used in nuclear batteries have half-lives ranging from tens to hundreds of years, so their power output remains nearly constant for a very long time. Unfortunately, the power density of betavoltaic cells is significantly lower than that of their galvanic counterparts. Despite this, betavoltaics were in fact used in the ’70s to power cardiac pacemakers, before being phased out by cheaper lithium-ion batteries, even though the latter have shorter lifetimes. Betavoltaic power sources should not be confused with radioisotope thermoelectric generators, or RTGs, which are also called nuclear batteries but operate on a different principle. Thermoelectric cells convert the heat released by radioactive decay into electricity using thermocouples. The efficiency of RTGs is only several percent and depends on temperature. But owing to their longevity and relatively simple design, thermoelectric power sources are widely used to power spacecraft such as the New Horizons probe and Mars rover Curiosity. RTGs were previously used on unmanned remote facilities such as lighthouses and automatic weather stations. However, this practice was abandoned, because used radioactive fuel was hard to recycle and leaked into the environment. A research team led by Vladimir Blank, the director of TISNCM and chair of nanostructure physics and chemistry at MIPT, came up with a way of increasing the power density of a nuclear battery almost tenfold. The physicists developed and manufactured a betavoltaic battery using nickel-63 as the source of radiation and Schottky barrier-based diamond diodes for energy conversion. The prototype battery achieved an output power of about 1 microwatt, while the power density per cubic centimeter was 10 microwatts, which is enough for a modern artificial pacemaker. Nickel-63 has a half-life of 100 years, so the battery packs about 3,300 milliwatt-hours of power per 1 gram — 10 times more than electrochemical cells. The team used 20 thick boron-doped diamond crystal plates as the substrate. They were grown using the temperature gradient technique under high pressure. Ion implantation was used to create a 100-nanometer-thick defective, “damaged” layer in the substrate at the depth of about 700 nanometers. A boron-doped diamond film 15 micrometers thick was grown on top of this layer using chemical vapor deposition. The substrate then underwent high-temperature annealing to induce graphitization of the buried defective layer and recover the top diamond layer. Electrochemical etching was used to remove the damaged layer. Following the separation of the defective layer by etching, the semi-finished converter was fitted with ohmic and Schottky contacts. As the above-mentioned operations were repeated, the loss of substrate thickness amounted to no more than 1 micrometer per cycle. A total of 200 converters were grown on 20 substrates. 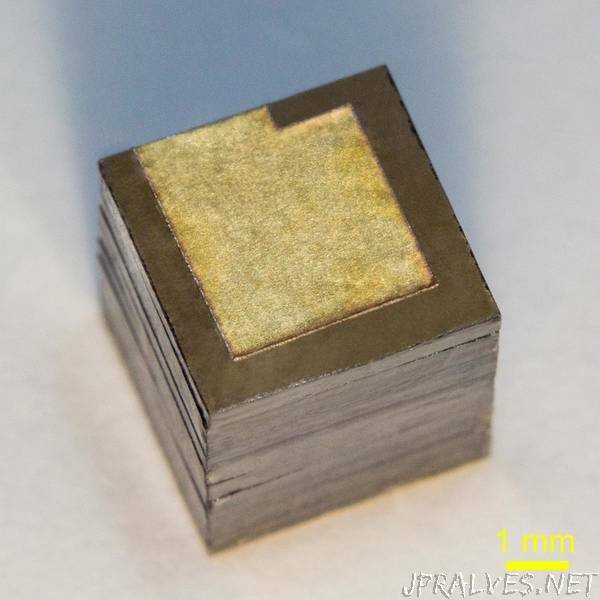 This new technology is important from an economic standpoint, because high-quality diamond substrates are very expensive and therefore mass-production of converters by substrate thinning is not feasible. The work reported in this story has prospects for medical applications. Most state-of-the-art cardiac pacemakers are over 10 cubic centimeters in size and require about 10 microwatts of power. This means that the new nuclear battery could be used to power these devices without any significant changes to their design and size. “Perpetual pacemakers” whose batteries need not be replaced or serviced would improve the quality of life of patients.